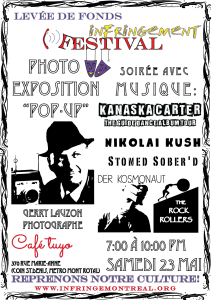 We will be having an evening of visual art, spoken word performance and music on Saturday May 23rd at 7 p.m. at Café Tuyo (370 rue Marie-Anne E.) in order to raise funds for this year’s Infringement Festival. We will be accepting cash donations from patrons and Gerry Lauzon, who will be exhibiting his photographic prints, has generously offered to donate 25% of the proceeds generated from the sale of his prints. As a matter of principle, we don’t have corporate sponsors, this guarantees that our artists are free to express themselves . However, there are always costs associated with putting on events such as those stemming from promotional materials, website, rentals and transportation. It is thanks to our patrons, artists, volunteers and local businesses that support this festival with their skills, talents, donations, space and effort that make this festival a reality. So, thanks to you all.